If you are looking for a rotary trimmer you have come to the right place. MyBinding.com carries a huge selection of rotary paper cutters including the full line of GBC / Swingline Smartcut, Akiles Roll @ Blade, Dahle, Papermonster and Keencut trimmers. We even carry replacement blades for many of the units that you see on the site. Whether you are looking for a small personal model that you can use on craft projects or a huge floor standing unit with a waste catcher to trim your banners and laminated materials, we have them all. Check out the options below and feel free to give us a call if you have any questions. Transcript: Welcome to MyBinding comparison videos. Today's topic is choosing the right rotary trimmer for your cutting needs. There are many rotary trimmers out there on the market to choose from. Here are four ideas to consider in your selection process. Welcome to MyBinding comparison videos. Today's topic is choosing the right rotary trimmer for your cutting needs. There are many rotary trimmers out there on the market to choose from. Here are four ideas to consider in your selection process. You definitely want to pay attention to the trimmer's cutting length. In the interest of not spending as much money, people will often choose for a smaller trimmer and then later on, with larger projects, really regret that fact. This Swingline SmartCut Commericial 24 is 24 inches long and is going to be able to cut most every length that you'll need. And this Premier PerfiCut 12 is only 12 inches long. Most rotary trimmers are built to handle the standard 8.5 by 11 inch papers. However, if you need larger, you're going to have to take that into consideration. Cutting capacity is just as important to consider. 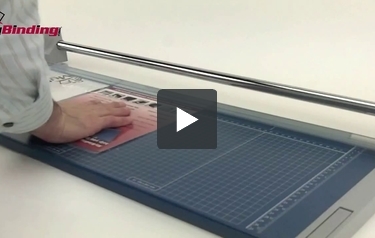 Cut capacity can vary greatly from a couple of sheets up to 15 and even 30 sheets of 20lb paper. Generally speaking, the lighter weight or more portable models can cut a lot less. And larger, more expensive, and all-metal construction type trimmers tend to be able to process many more sheets at one time. This trimmer in the Dahle 500 series is one of those. For higher cutting capacity trimmers, look for things like "professional" and "commercial". The third area to consider is construction. How well is the paper trimmer built? Generally that will be reflected in the price. However, if you have a lot of work to do and you need your trimmer to last a long time, the investment is worth it. Dahle trimmers as well as Fellowes, seen here the Atom model, tend to make great ones. Swingline probably has the largest range of construction and durability. And finally, there's multi-function. Generally speaking, the less it can do, the better it can do it. However, there are a couple of really great all-in-one or multipurpose trimmers. The strength of the Premier PerfiCut is that with one button you can make a slice or perforated lines, it's just that simple. The Swingline Dial-a-Blade Plus is a great little multipurpose trimmer and quite durable, too. Simply by twisting a dial on the knob, hence Dial-a-Blade, you can go from a wavy cut to a crease, a straight normal cut, and also a perforated line. All of that done well with just one trimmer. And some trimmers go really overboard on measuring tools and fences for help with special and customizable projects. So in your shopping, keep in mind cutting length, capacity, durability, and multifunction. Give us a call or keep clicking around, we're here to help you find the right rotary trimmer for your needs. For other comparisons, demos, reviews, and how tos, check out MyBinding.com.